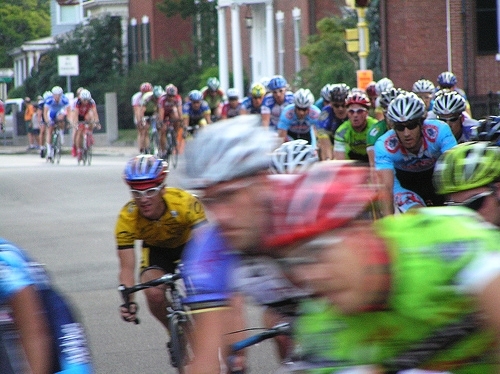 Arrived in Salem this evening just in time for the conclusion of the Witch’s Cup Bike Race, five hours of whirring tires around Salem Common that enforces a strict no-automobile zone throughout my entire neighborhood! Gotta love it! You can see a few photos from last year, dubbed as the 1st Annual Witch’s Cup, although I can clearly recall the last big race held here, which was the final leg of the America’s Cup in 2000. What a pleasure it is to be free of the stinking toxin-buckets for a few hours, with crowds of people standing around and enjoying the evening breeze while they watch the pack of fired-up cyclists taking those low curves in their shiny jerseys. If only people would understand that we can save energy and do these things in our own towns! There is no need to drive like maniacs in every direction in order to send our children to sporting events…really, it is crazy to think that we must all breed Olympians. The fact is that the vast majority of us are breeding donut-eating shopping mall workers, you know… clerks. And more power to them!